Article written by Dr Jun Li from the University of Essex. Dr Jun Li is the Senior Lecturer in Management Science and Entrepreneurship. Highly educated graduate entrepreneurs can be ‘high quality entrepreneurs’ with substantial growth potential. Education contributes to the development of human capital, and provides students a set of opportunities and resources unavailable to those less qualified. People with high human capital have been found to be more likely to identify more entrepreneurial opportunities, to exploit opportunities, and to have better performance of their new ventures. As such, university graduates have been encouraged to consider entrepreneurship as a career option and are supported by their universities one way or another. There is high hope that when university graduates succeed in starting new businesses, they increase innovation, job opportunities, competition in the market place, and the likelihood of increased self-reliance and wellbeing. Surprisingly, most highly educated graduate entrepreneurs are actually not so innovative. Evidence from Scotland and China suggests that the businesses they started were “unimaginative, routine and far removed from the ideal of high performing firms”. Equally surprisingly, even for those who received intensive support and training to start businesses, except only a handful of very successful businesses, most of the businesses started were not imaginative ‘cutting edge’ businesses either.Imitative entrepreneurs start businesses in an established market whose routines, competencies, and offers vary only minimally from those of existing organizations; they bring little or no incremental knowledge to the populations they enter and organize their activities in the same way as their predecessors. Accordingly, the impact of imitative graduate entrepreneurs can be limited. 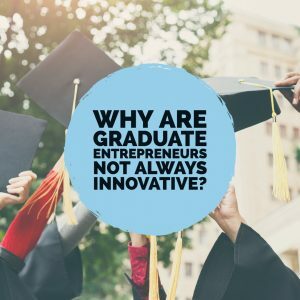 Why are graduate entrepreneurs not always innovative? That is the central question addressed in our recent paper published in Entrepreneurship and Regional Development (2018, Vol.30 No.5-6). Our research weighs in on the ongoing debate over how to promote graduate entrepreneurship. We assess the determinants of innovative graduate entrepreneurship from multiple theoretical perspectives. There are three takeaways from the research. First, graduate entrepreneurs with greater ‘quantity’ of human capital, arising from quality of education, leadership experience from extracurricular activities, work placement experience, and entrepreneurship education and training, are more likely to exploit opportunities innovatively. While university students commonly invest their money, time and emotion in human capital development, the output of their investments diverges as a result of the length and quality of education, participation in extracurricular activities and work experience activities, and engagement in entrepreneurship education and activities. Students who have developed high human capital have better career prospects and high opportunity costs, meaning a larger gap between expected utility of exploiting opportunities and the alternative uses of their human capital. High opportunity costs mean greater needs to exploit opportunities more innovatively. Hence, differences in graduate entrepreneurs’ innovativeness can be affected by the differences in individuals’ human capital and resulting opportunity costs in opportunity exploitation. Second, graduate entrepreneurs’ psychological make-up such as managerial self-efficacy and overconfidence has a significant impact on the innovativeness of opportunity exploitation. Human capital is a necessary but not sufficient condition that influences students’ decisions on innovative opportunity exploitation. Some students who have high human capital and high opportunity costs may never decide to exploit entrepreneurial opportunities. Students who have high managerial self-efficacy are more confident with their abilities to acquire and utilize resources more effectively, thereby more likely to exploit opportunities innovatively. Hence, individuals’ difference in entrepreneurial innovativeness is influenced by the difference in entrepreneurs’ psychological make-up. Third, graduate entrepreneurs’ innovativeness is influenced by their anticipations of entrepreneurial rewards as embodied in the likelihood of new venture success. Students with high human capital and high opportunity costs are motivated to exploit opportunities innovatively. They would be even more highly motivated to exploit opportunities innovatively in the light of lower financial rewards from entrepreneurship than from paid employment. In opportunity exploitation, a more radical approach, if successful, may result in greater entrepreneurial rewards from venture success as afforded by first mover advantages. Nonetheless, innovativeness increases the probability of failure. Paradoxically, taking more chances does not improve the prospects of entrepreneurial rewards in the short term. The odds of success would increase only if the entrepreneurs could be resilient enough to withstand early setbacks. This curvilinear (U-shaped)relationship between innovative opportunity exploitation and entrepreneurial rewards suggests thatinnovation behavior is influenced by the interplay of opportunity costs and entrepreneurial rewards. There are three implications of our study. First, the quality of education provision is of crucial importance in the formation of human capital and the emergence of more high quality entrepreneurs, and universities should do what they do best by placing excellence in education at the centre of their education strategy. Second, entrepreneurship education needs to develop students’ self-efficacy and address their deficit of knowledge and skills in finding and using resources in opportunity exploitation. Third, entrepreneurship education needs to develop graduate entrepreneurs’ resilience and provide coping support in order to help them navigate the uncharted waters of innovation and withstand setbacks.